Farm accidents are a huge problem on Irish farms. 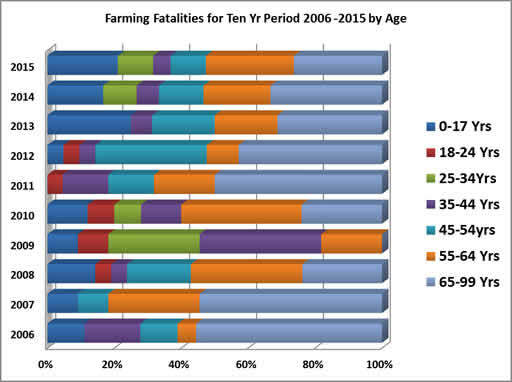 The fatality rate in agriculture is far higher than any other economic sector. A large proportion of all fatal workplace accidents occur in agriculture, even though a small proportion of the workforce is employed in farming. The level of farm accidents is not decreasing. similar accidents occur each year. Research indicates that, in general, farmers’ attitudes to safety only change after serious injury occurs. Irish farmers need to take farm safety more seriously. As we all know, it is too late to make changes once a serious or fatal accident has occurred. We are urging all farmers to look around their farms to see what measures they can take to make their farm a safer work place. Children and older farmers are most at risk on Irish farms. We need to strive to protect the most vulnerable people on our farms. Ensure all gates, barriers, troughs, etc. are fixed and hanging correctly. Install plenty of lights so if you are working in the dark you will still be able to see dangers around the farm. Ensure you have your phone on your person at all times. If you are working alone always tell someone where you are going and how long you are expecting to be. Ensure you carry out all safety checks and regular maintenance on all machinery. Ensure you have a crush head gate in correct working order to be able to bail an animals head when working on them. Have the vet’s number saved on your phone for any emergencies that may occur during the calving season. Ensure you have a calving gate installed and bail a cow during calving to reduce the risk of the cow attacking you. Have a designated area away from the farm yard for children to play. If there is an elderly person living or working on the farm ensure they are accompanied at all times to reduce the risk of falls during frosty weather. Most importantly DO NOT TAKE UNNECESSARY RISKS! Keep farm safety a priority this spring! Lamb Adoption…. Keep it Simple.